A review of the afternoon tea at The Peninsula hotel in New York with photos of every course from the tea sandwiches and the scones to the sweets. 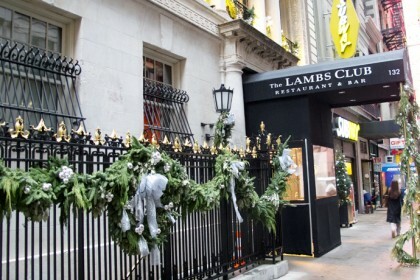 The Peninsula New York is a luxury hotel in Midtown Manhattan, right on Fifth Avenue. The entrance to the hotel is on 55th Street and upon entering through the doors, take the grand staircase up to the mezzanine level. Afternoon tea is served at the Gotham Lounge where guests can also go for a light snack or a cocktail. Afternoon tea is a set menu, meaning you don’t choose any of the food listed. You get EVERYTHING that’s listed. Don’t worry, this doesn’t mean you need to fast for two days before since everything is bite-sized and tiny. 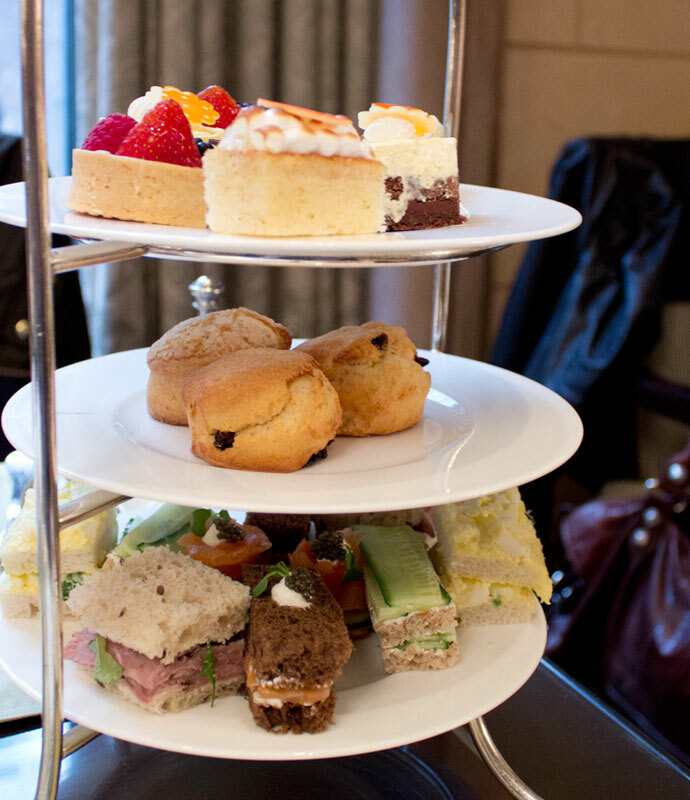 Afternoon tea is priced per person and each order comes with a pot of tea and three tiers of food. 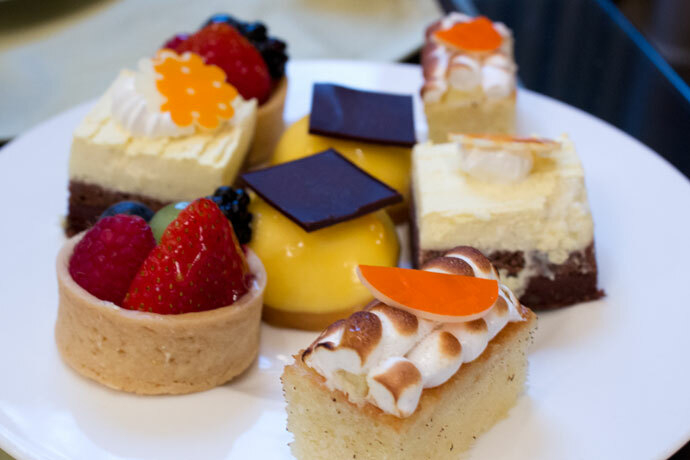 Does The Peninsula Have More Than One Kind of Afternoon Tea on the Menu? 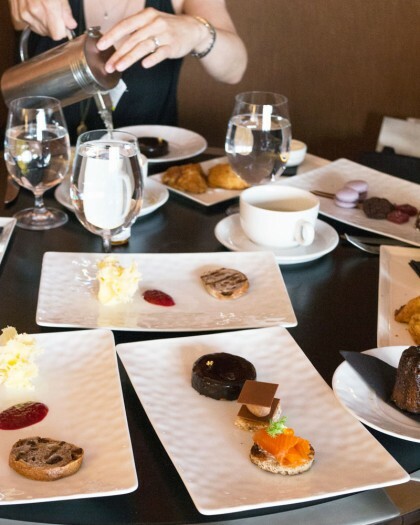 The Peninsula New York does three kinds of afternoon tea: the Traditional Afternoon Tea, the Grand Afternoon Tea which comes with Champagne and caviar, and a Children’s Afternoon Tea. How Much is Afternoon Tea at The Peninsula? 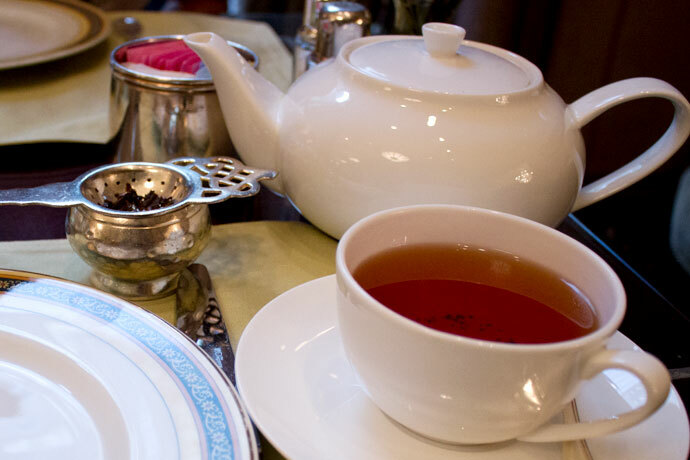 The Traditional and classic tea service is $65 per person. It’s served on a three-tiered tray with tea sandwiches, scones, and sweets. 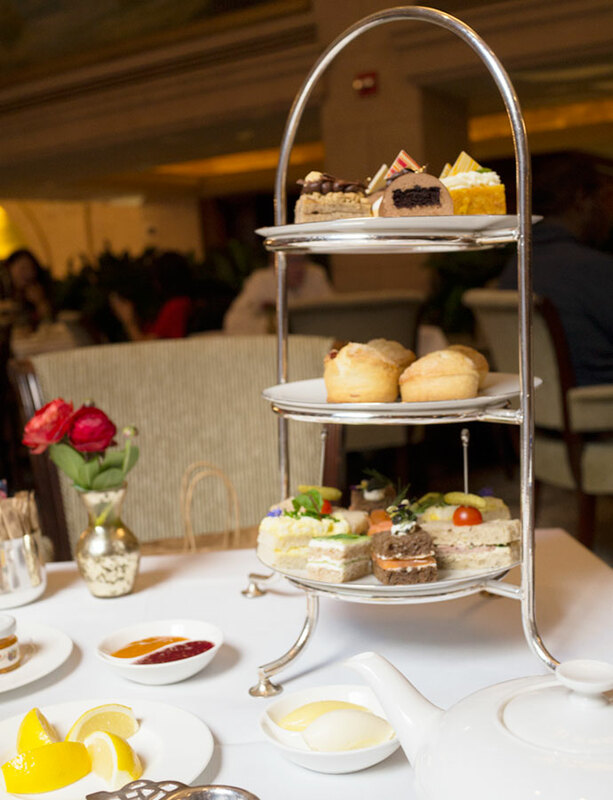 The Grand Afternoon Tea includes everything from the Traditional Afternoon Tea and it’s priced for two people at $395. Why so much? It comes with Champagne and caviar. The Children’s Afternoon Tea is $40 per child. Do I Need to Make a Reservation for Afternoon Tea at the Gotham Lounge? The Gotham Lounge takes reservations but it’s not required. However, I always recommend making reservations since it’s better to be safe than sorry. It’s a little easier to get a table for afternoon tea at The Peninsula than other luxury hotels so if you don’t have a reservation and want tea, go here since chances are good you’ll get a table. What Do I Wear for Tea at The Peninsula? The dress code is smart casual, which is what I suggest for almost all afternoon teas. By smart casual, you should look put together and neatly dressed. If you want to wear jeans, opt for dark colors without rips. I would avoid sneakers. How Long is Afternoon Tea at The Peninsula? Afternoon tea usually lasts about two hours. It’s a leisurely and relaxed affair so be sure to enjoy every minute. 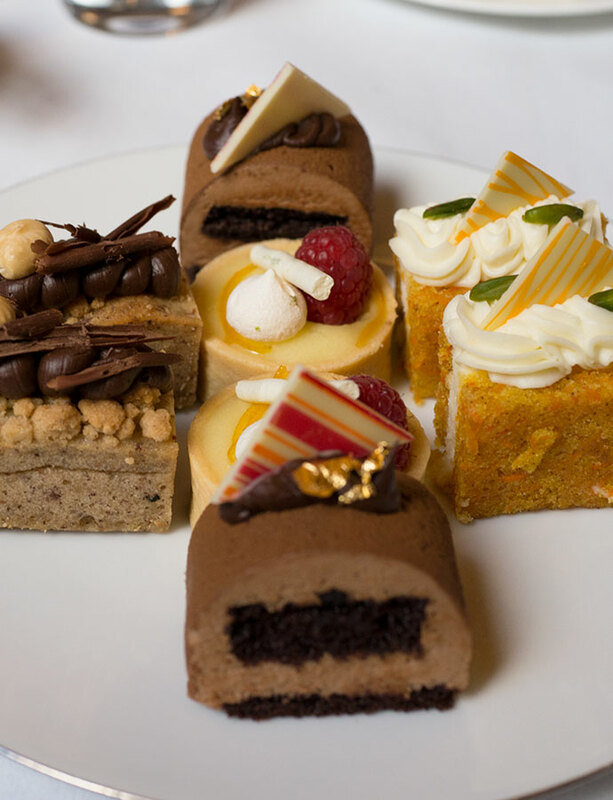 What Time is Afternoon Tea at The Peninsula? 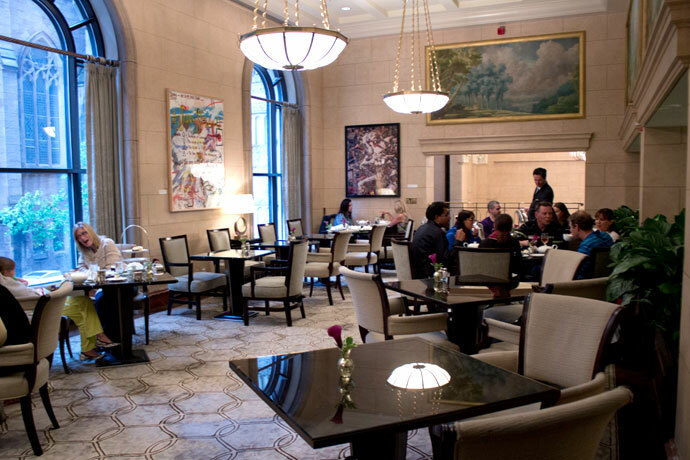 Afternoon tea is served daily from 2:30PM – 5PM. I always recommend that you make your reservation earlier rather than later in the afternoon since it may get a bit more busy and noisy after work hours. I usually make my tea time at 3PM which leaves room for a light dinner. 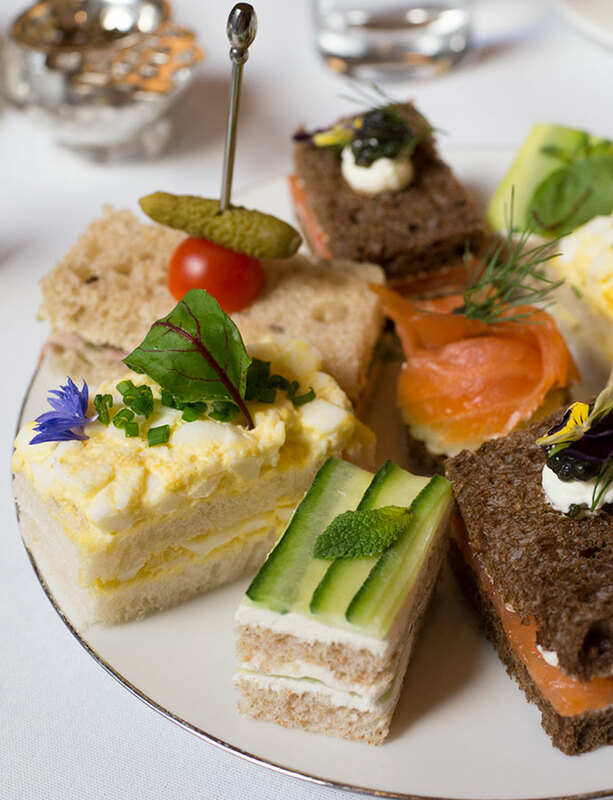 How Does Afternoon Tea at The Peninsula Work? Before the server arrives, decide on which afternoon tea you would like and the tea you want to drink. If you’re undecided with which tea to choose, go for one of the house blends (Peninsula Morning Blend or the Peninsula Afternoon Blend). 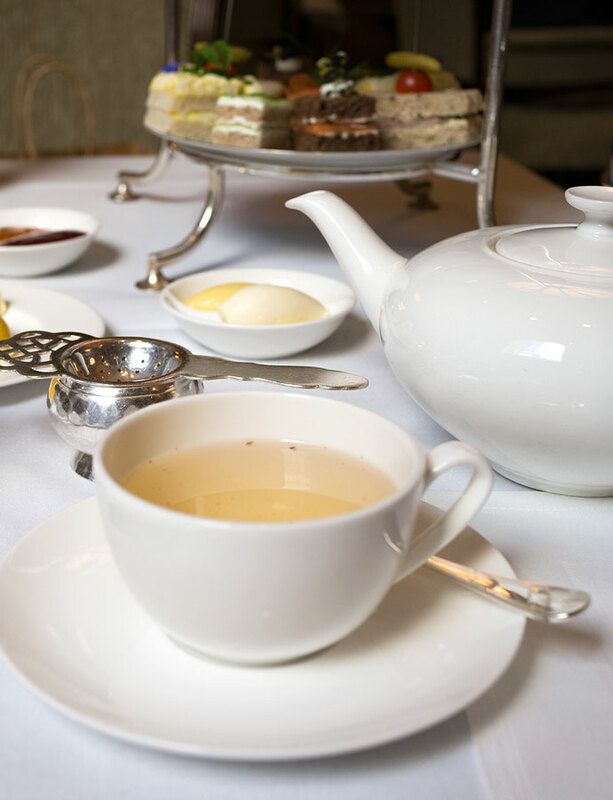 When the server is ready to take your order, let him or her know you would like to order the afternoon tea and your tea selection. The tea will arrive first to the table followed by the food on a three-tiered tray. I don’t love the look of the Gotham Lounge, it looks like a business class airport lounge and feels very corporate. A plus is that the tables are spaced far enough apart so you don’t feel like you’re joining in on the next table’s conversation. A lot of business suits can be seen here and I will never forget the time Kathy and I had afternoon tea across from a table of four men in business suits who had ordered afternoon teas. Four three-tiers of food stood there untouched the entire time during their two hour meeting. At the end of the two hours, the servers came by and asked them if they were done. THEY SAID YES AND THE UNTOUCHED AFTERNOON TEA TRAYS WERE TAKEN AWAY. I was horrified. What a waste! The service here is excellent. I tried pouring the tea and spilled it all over my side of the table and a server came right over to assist me. He stopped by to pour my near empty teacup throughout the tea service. All done with a smile. The tea selection is very good with a nice variety. I like that they have blends and whole leaf teas like Bai Mu Dan. Excellent presentation of savories. 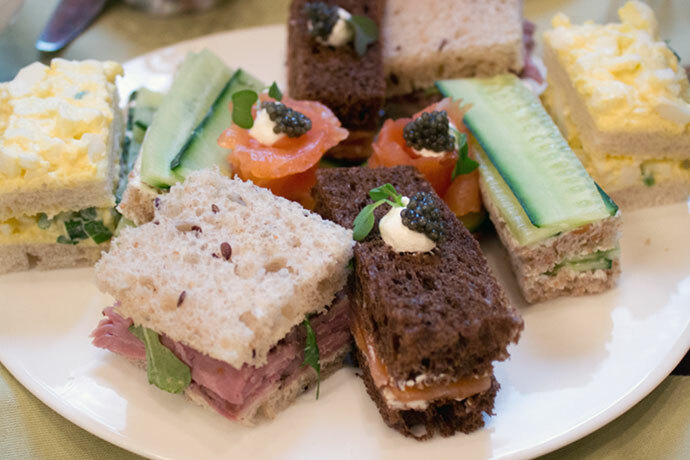 The perfectly made tea sandwiches were pure eye candy. Delicious. No stale or cold bread here. Each person gets four perfectly made, crustless tea sandwiches. Two scones per person and they were a nice, manageable size. 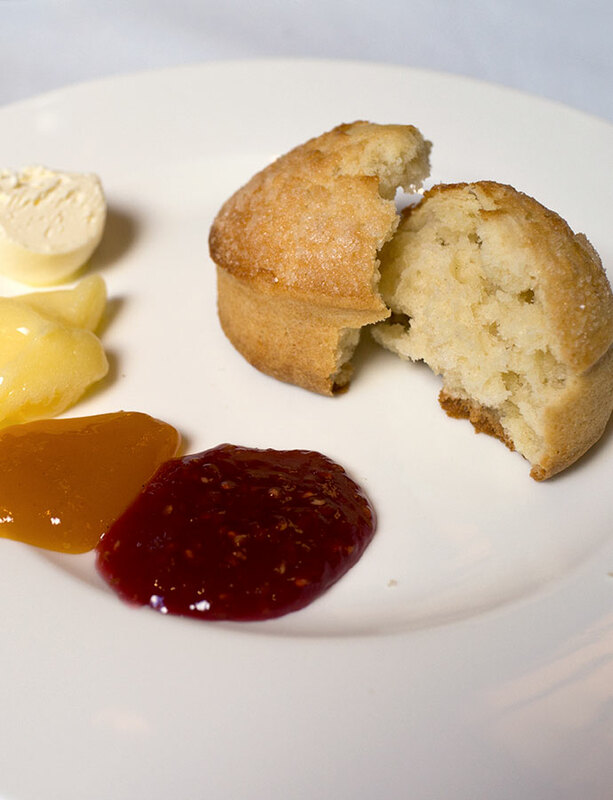 Served with jams, lemon curd, and clotted cream, they were soft and fluffy on the inside with a crusty thin exterior. Nicer than the year before when I went, with a good variety of sweets. The hazelnut mini cakes were good but nothing wowed me. It’s a solid afternoon tea although not the best. 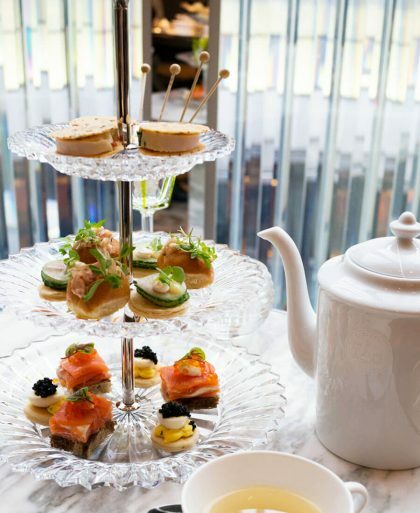 In 2013, The Peninsula’s afternoon tea was $55 and it was one of the most expensive in the city. The Gotham Lounge definitely had a more of a airport lounge look going. The tea, was served loose leaf (as they always should). The three-tiered mess compared to now was a bit less put together. The sandwiches are a mess and really sloppy looking. However, they were still delicious and fresh. This was an odd one. They served three scones for our part of two. 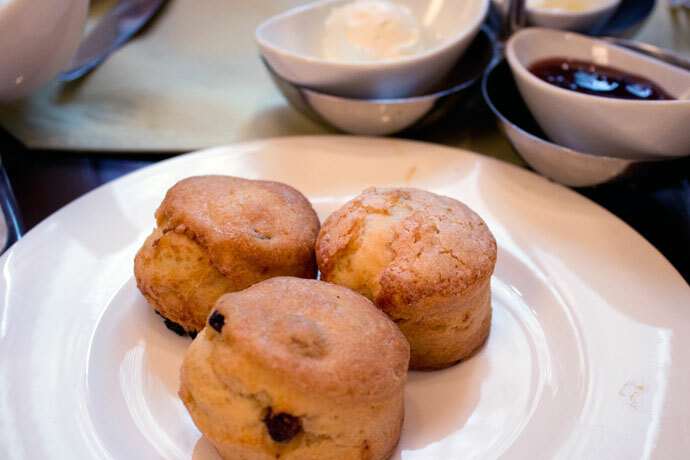 I don’t know why they didn’t serve us a total of four scones so we can have two each. The sweets were a miss then too. The cakes were too dense and didn’t really taste too fresh. They definitely had a store-bought quality to them.